HYT re-work their unique fluid mechanics to create two new limited edition models - the HYT Skull watch. Naturally this is no simple revamping of previous models. The new angular profile presented extreme difficulties in its design - and that was only the beginning. To ensure that enough power was available to drive the fluid through the bends and curves while still remaining accurate gave HYT's technical team another puzzling conundrum. But they achieved the seemingly impossible and the resulting "dial" bereft of minutes creates quite a statement. The seconds are indicated behind the skull's left eye, rotating constantly and a power reserve is displayed behind the right. The twin bellows which expand and contract to move the fluid add "life" to the jaw bone of the skull, but the effect is artistic and not in the least bit macabre. 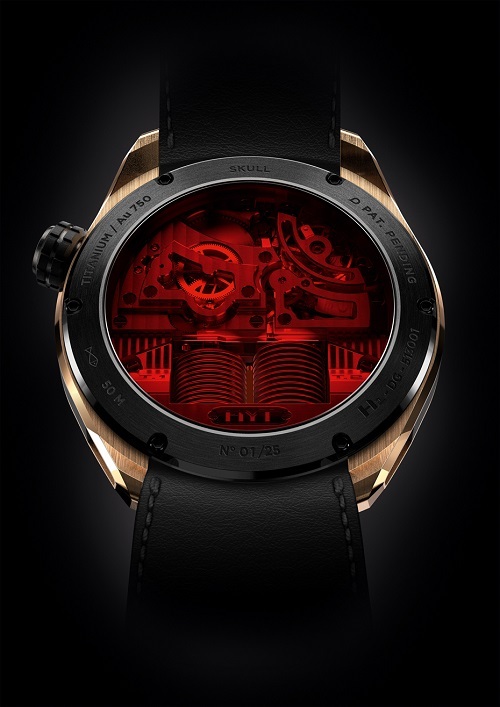 The Swiss manual-wind HYT in-house Calibre 101 provides it own spectacle, viewed through red or green tinted sapphire depending on the model. Two case variations will be available, black DLC titanium limited to 50 pieces or the more exclusive option of black DLC titanium with 18kt rose gold limited to just 25 pieces. More details at HYT's official website.